Rugged PCs, which are predominantly used for vertically aligned commercial computing needs, are designed to meet certain stability and reliability standards in harsh environments, including extreme temperatures, dust, moisture, water, shock, and vibration. Deployed more like infrastructure than traditional commercial PCs in fields like law enforcement, fire and rescue, mining, and oil and gas exploration, rugged PCs are mission critical in these sectors where minimal downtime is a key competitive necessity and customer requirement. Dell’s unique approach to rugged computing includes a battery of tests and hardware development methods designed to produce more reliable, rugged systems, and its scale allows it to deliver the latest technologies faster and more reliably to the market. 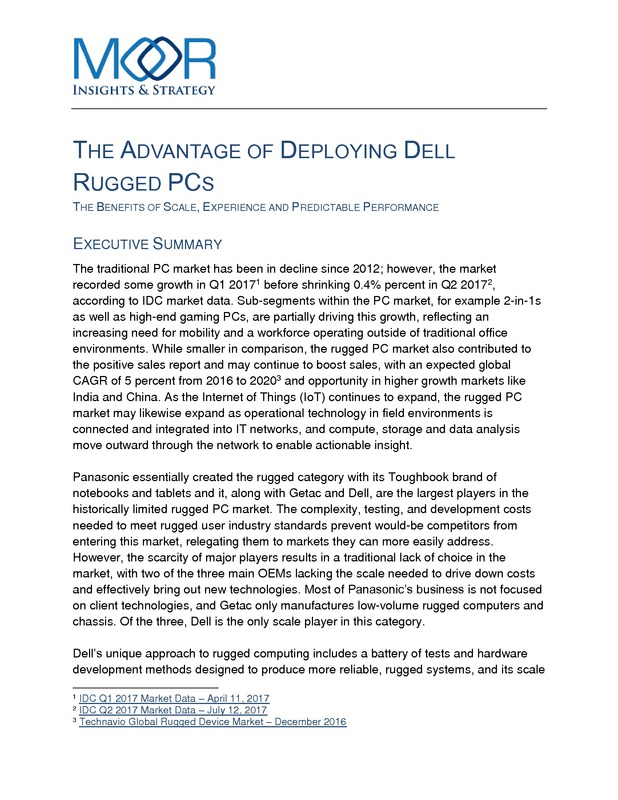 Download this paper to understand how Dell Rugged systems provide advantages to businesses and organizations.